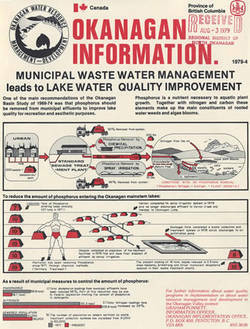 In 1965 the Okanagan Watershed Pollution Control Council was established by local government to address growing concerns about pollution in the lakes. Clearly, water pollution affects all valley residents, and taking a whole-watershed perspective was the cutting edge of environmental science. The purpose of the Council was to give advice on development proposals and to lobby senior government for action to protect the valley lakes. One of the achievements of this group was to help obtain funding for wastewater treatment from the Province. Water quality was only one of many water concerns in the Basin. Since the early days of wide-scale orcharding, water supplies had always been a limiting factor for growth and development. Many other water-related issues—from the need to protect fish-bearing streams to the need to limit construction in flood prone areas—also called out for a watershed approach. In 1969 the Okanagan Basin Water Board was established under the Municipalities Enabling and Validating Act, and the Council was disbanded. Among the objectives of the OBWB were to better-define water resource problems in the valley and determine priorities and opportunities for solving them. The Board was also asked to receive proposals and find funding for water management projects, and to improve communication and collaboration among levels of government and government agencies. The joint Federal/Provincial Okanagan Basin Study commenced in 1969, shortly after the OBWB’s formation, and was completed in 1974. This comprehensive study formed the basis of recommendations on water quality and supply management, as well as land use. The study was a landmark of public involvement, seeking to define the direction of the Okanagan Basin until 2020—taking a fifty-year perspective. An Okanagan Basin Implementation Board collaborated with the OBWB in implementing these recommendations until 1982. One of the study’s main findings was to reiterate a strong need for coordinated basin-wide water resource management. At the time of the OBWB’s inception, the most pressing valley-wide water management issues were water pollution from sewage treatment facilities and the explosive invasion of Eurasian watermilfoil (Myriophyllum spicatum) throughout the lake system. To address water quality problems, the OBWB initiated a grant program supporting upgrades to existing wastewater treatment systems. This extremely successful ongoing program has resulted in near complete control of nutrient pollution in the Okanagan lakes system, with tertiary treatment in all facilities. The watermilfoil control program began as a partnership between OBWB and the Province, working with experts from across North America and experimenting with a wide variety of treatment options. During the early 1980s, the OBWB took over Eurasian watermilfoil control efforts. Today, a small crew using mechanical control methods keeps public areas, beaches and boat docks relatively weed-free. For many years, the three Okanagan regional districts were satisfied to have the OBWB focus on overseeing Eurasian watermilfoil management and providing funds for wastewater treatment upgrades. However, dramatic expansion of the watershed’s population at the turn of the millennium, together with a comprehensive study examining the impacts of climate change on water supply, a drought in 2003 that pitted farmers against fisheries regulators in Summerland, and a number of other factors, raised public concerns about the long-term sustainability of water in the Basin. Community leaders, including the Okanagan Partnership and the Water Supply Association of BC, convinced the regional districts that this was a good time to revisit and refresh the Board’s original mandate – looking at basin-wide water concerns, and finding collaborative solutions. The essence of the Board’s initiative is to take a more active leadership role for water management in the valley—reflecting the original mandates from 1969-1970. Good leadership depends on having a comprehensive understanding of issues in different parts of the Basin and how they relate to one another. In 2006, the Board instituted an Okanagan Water Stewardship Council to provide high-level technical advice from a wide range of local experts. This Council meets regularly to discuss water concerns, and provide policy recommendation to the Board. The Board also added three Director positions with representatives from the Okanagan Nation Alliance, the Water Supply Association of BC, and the Water Stewardship Council. The Board is a major partner in the Water Supply & Demand assessment of the Okanagan watershed—a multi-year study that updates the 1974 baseline assessment and provides the best possible estimate of water availability into the future. To support this research and raise awareness about water issues in the Basin, the Board established the Water Conservation and Quality Improvement Grant Program. In the end, there are no perfect solutions for the equitable distribution and protection of water resources. Nonetheless, the best way to reduce conflicts is through clear communication, good science, and taking a comprehensive, watershed-view of problems as they arise—helping us more smoothly adapt to change. This was the original vision of the Okanagan Basin Water Board.